When an impact hits ground that contains a lot of water (or water ice), the debris thrown out in the impact makes a distinctive pattern resembling a splash or mudflow. The outer edge of the debris, which usually shows lobes, is upraised. 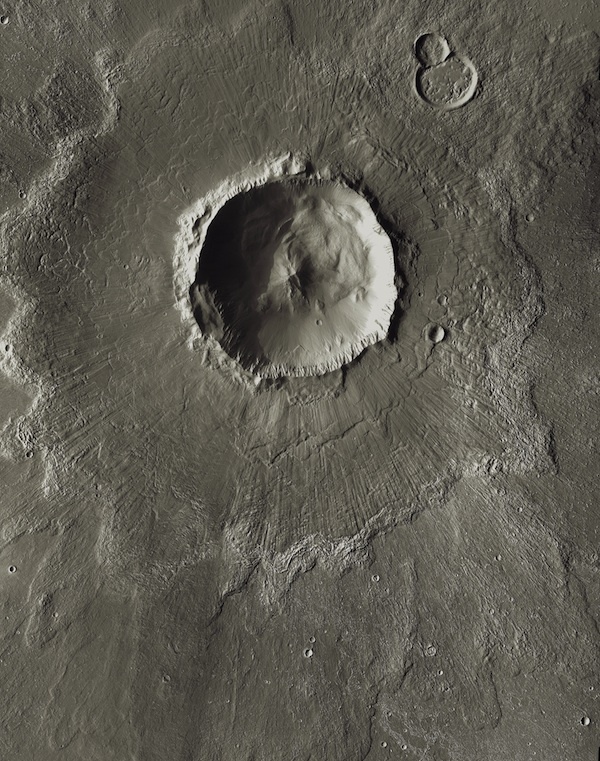 This feature gives the name "rampart" to this type of crater. Rampart craters exist in many places on Mars, but small ones however lie only at high latitudes where ice is found at shallow depths. The rampart forms as the blast wind from the impact, loaded with debris, flies out from the crater. Scientists think that if the debris has steam and water vapor mixed in with smaller particles of solid debris, the ejecta will flow more easily and go farther. Racing at speeds of several hundred kilometers per hour near the rim, the blast winds develop a rolling motion as they spread out and advance. At some distance from the crater, the outer edge of rolling debris cloud abruptly halts. When it does, the debris immediately behind piles into it, pushing up the rampart. Some rampart craters show a second rampart on top of the main one. This is probably caused when impact debris thrown straight up in the initial blast falls back, then makes a secondary surge outward.